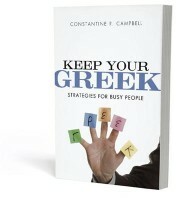 Still Learning… » Blog Archive » Keep Your Greek! As a Greek instructor, I’m always looking for ways to help my students retain their Greek knowledge. Ok, let’s be honest. I’m always looking for ways to retain my Greek knowledge too. So when the opportunity to review Con Campbell’s, Keep Your Greek came along, I eagerly took advantage it. We all know the importance of original language study for helpful Biblical exegesis and exposition, but we also know those in ministry whose memory of Greek grammar and vocab are just that, faded memories. This book is helpful for both students wanting to keep their Greek from fading and those in ministry who desire to sharpen their memory of almost forgotten participles and pronouns. This book began as a series of blog posts back in January of 2009, and as a result the book has a very engaging, personal feel to it. The book is short (less than 100 pages) and a very quick read. I sat down with it the night I got it and finished it in less than a hour. A unique element of the book, due to the fact that it started as a series of blog posts, is that Campbell includes at the end of each chapter some of the comment conversation that the original posts received. This adds to its light, easy-to-read style. None of these principles are earth-shattering, but Campbell makes them easy to understand, and even better, easy to implement. The professor called me into his office and told me that I should check out of Greek. That was the wake-up call I needed. I went down to my dorm room, got on my knees, and confessed to the Lord that I had dragged his name through the mud. I reasoned that since I am in Christ and he is in me, he was failing Greek, too. And even though I was at a Christian school, I was soiling his reputation. I repented of my sin–the sin of mediocrity because I was surrounded by Christians, the sin of thinking that I did not need to do my best since I was a Christian. I went back to the professor and asked for one more chance. He granted that to me. I ended up getting an A in the class both semesters. It still took me two more years of Greek at Biola before I even felt moderately comfortable with the language, but I had learned my lesson. Now, to be sure, my experience is not everyone’s. But, for me, learning Greek became a matter of spiritual discipline. And even though I was very sick in my fourth semester of Greek–so that I missed five and a half weeks of school–I still did well in the course. I don’t consider myself good at languages, but I do consider myself a steward of the life that God has given to me. And I have never recovered from the impact that the Greek New Testament has made on my walk with Christ. This is not the author’s testimony, but that of one of the foremost contemporary Greek scholars, Daniel Wallace. Yes, The Daniel B. Wallace! If you’re struggling, you can excel, but you have to take it seriously. My only criticism is that book is so short. I would have loved to have gained more from it. Overall, this was a great book and I plan to recommend it to many of my students. Aunt Joy on Would Paul have used smiley faces in his letters? andy on Would Paul have used smiley faces in his letters? Stuart on Would Paul have used smiley faces in his letters?